Perhaps the most profound part of the Buddha’s Dharma is the description of how the wheel of life, death and rebirth rolls on. Over the next four weeks we will explore the Buddha’s teaching on the twelve links of the chain of existence traditionally called the Law of Dependent Origination. The classes will follow the 5:30pm meditation from 6:00pm to 7:00pm. The Four Wisdoms are said to be “enlightened action”. When we act with charity, or tenderness, or benevolence or sympathy, we are exhibiting enlightened action. On Fridays in April we will explore The Four Wisdoms – charity, tenderness, benevolence and sympathy and how we live them in our daily lives. The classes will follow the 5:30pm meditation from 6:00pm to 7:00pm. On Friday, April 19, we will explore benevolence. On Friday, April 26, we will explore sympathy. On Saturday, April 20, we will have a Meditation Tune-Up Morning. The schedule is below. You are welcome to come to all or part of the morning. For those new to the Priory it is a good introduction to our meditation practice. For “old-timers” it’s a good opportunity to check posture or ask questions about your practice. Meditation is at 10:30am followed by a Ceremony and a Dharma Talk. On Sunday, April 21, we will have a Transfer of Merit Ceremony. On Sunday, April 28, we will have a Renewal of Vows Ceremony. On Sunday, May 5, we will have a Meditation Sunday. 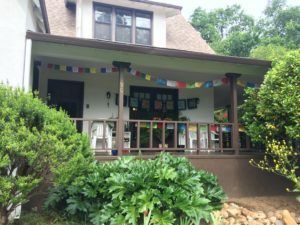 On Thursday, May 16, we will celebrate Wesak at the Priory with meditation and our Wesak ceremony starting at 5:30pm and a festive potluck meal. On Sunday, May 19, we will celebrate Wesak at Shasta Abbey attending the 10:30am ceremony, ringing the big bell, and enjoying the afternoon picnic together with monks and laity. There is NO mediation or ceremony at the Priory this morning. On Sunday, May 26, we will have a Memorial Day Ceremony. The Priory is closed on Monday. Please email Rev. Helen at reddingzen@gmail.com for information or with any questions you might have about the upcoming Priory schedule.